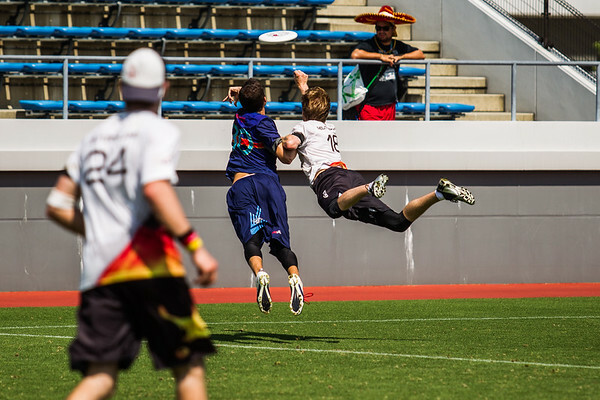 This page is dedicated to foreign readers that want to learn something about Ultimate in Germany. It gives you a short overview over the sport, structure and latest results. 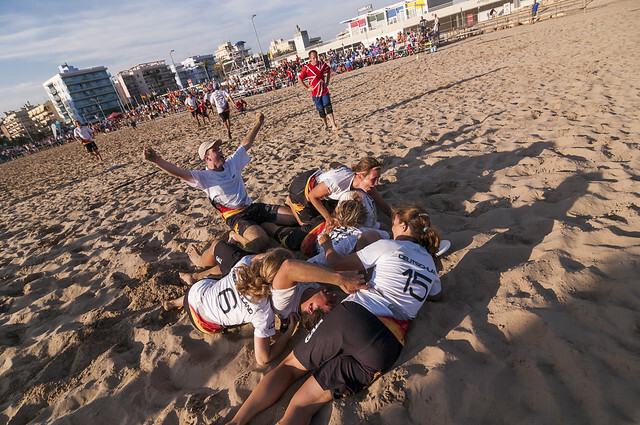 The governing body for Ultimate in Germany is the „Deutscher Frisbeesport-Verband“ (DFV). In September 2013 there were nearly 2500 frisbeeplayers registered at the DFV, but including the not registered players there should be around 6000 players all over the country. In Europe only the UK has more registered players. Nearly every bigger town in the country houses a team – total there are more than 50 registered teams in the country (May 2012). Over 46 open and women teams competet at the recent German Championships, which finals took place in Frankfurt. 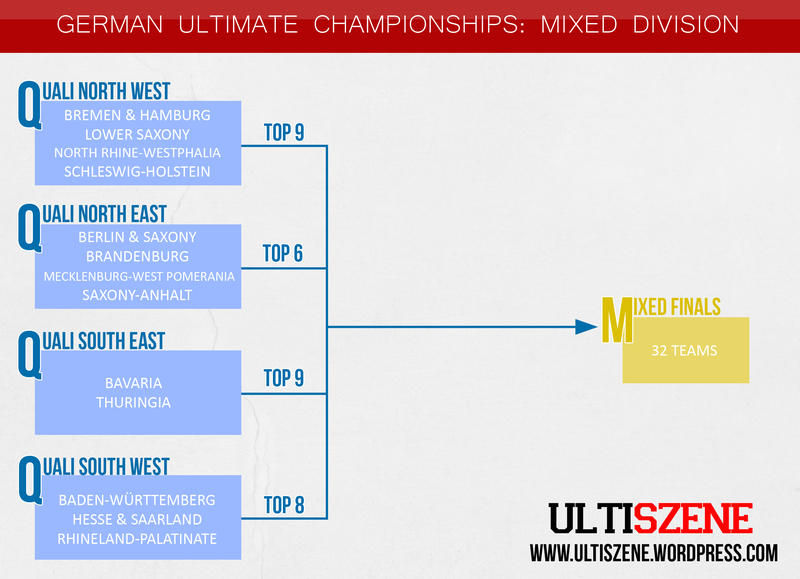 Within Germany the biggest hotbeds of ultimate are Berlin, Munich and the area of Heilbronn. Despite being one of the biggest Ultimate nations in Europe the sport it is not jet recognized as an official sport by the government. You can get more informations at website of the DFV. 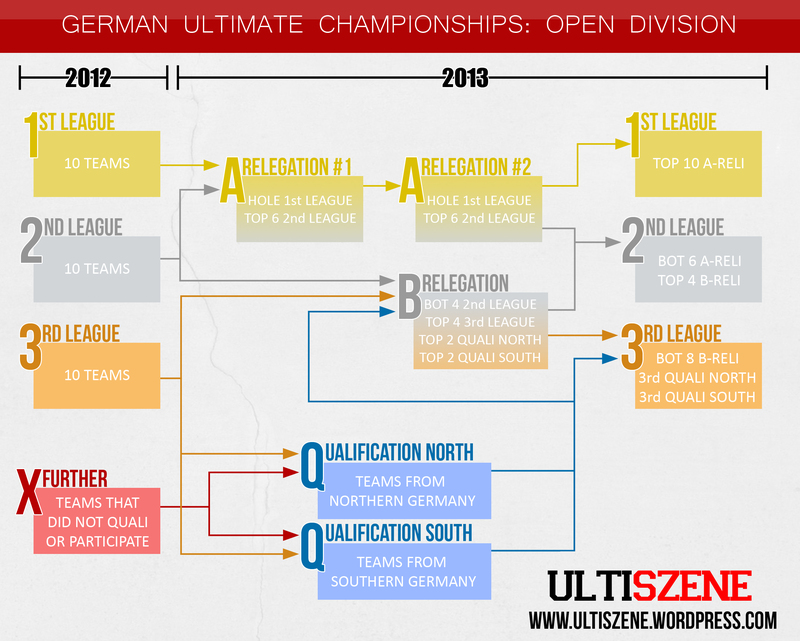 * Get Horizontal (01/14): Germany Ultimate – Europe’s next Powerhouse Country? You can watch the final of 2013s open division in the video below. You can find a complete list of all German champions at Wikipedia. Every box represents one tournament. For example the first league is played over one weekend, but the A-Relegation is played over two weekends. Note: The same system is used in 2014. 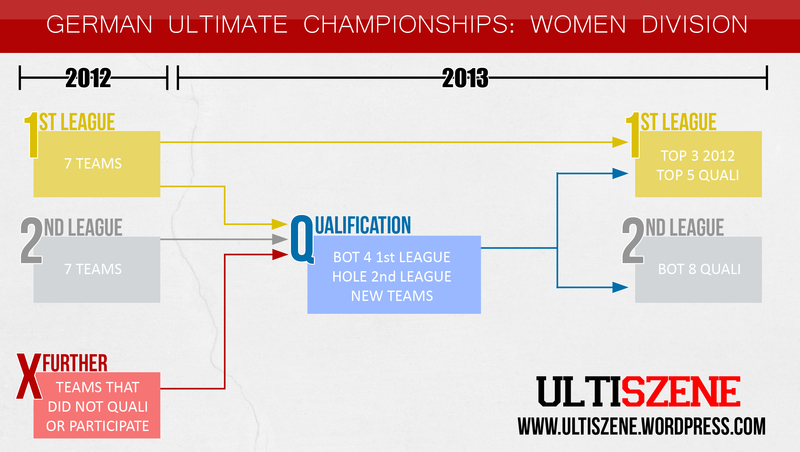 It is possible that there will by some changes in how to qualify for the first women-league in 2013. So it is not granted that this structure is 100% right. Open: (3/24) Bad Skid, (6/24) Heidees, (12/14) Sieben Schwaben, (22/24) M.U.C. Women: 1st Place – European Champions! Women: 6th Place – Best European Team! Mixed: 2nd Place – Best European Team! U20 Open (Worlds): Bronze Medal (3/24) – Best European Team! If you have any questions please feel free to comment or send a message!